My sister-in-law called me last week to stop by and see her pretty blue hydrangeas. She was a having a small dinner party and chose blues and greens for her table... Such a beautiful combination. I love blue and green together! I'm a little mad about something. She actually asked me if I wanted these green glasses a while ago! She thought since she is clearly a blue girl and I'm a green girl, naturally, I should have the green glasses... what in the world was she going to do with green glasses? Drats! She figured it out! They are just perfect! I found this amazing antique stove for her! The minute I saw it, I started dialing... no answer.... no answer. Finally I sent a picture to her cell... seconds later, my phone was ringing. A no-brainer... it's so perfect in her living room! This delft collection was separated in the family at some point and I had one... not sure how that came about. Again, the "she's a blue girl, I'm a green girl" thing... I returned the missing link to complete this spectacular collection! So guess what I saw at the grocery store yesterday? The same brilliant blue hydrangeas! I couldn't resist picking one up... I honestly don't think I have ever bought a blue plant or flower before! PS Chandelier reveal this Friday! So much beauty in one house. I love hydrangeas and have them all over too and anyone with a delft collection is someone after my own heart, that blue and white just makes my heart go pitter patter:) Gorgeous! Hi Jan, Your sister-in-law has a lovely home and that stove you found for her is amazing! Love the hydrangeas my shrubs are almost in blossom and I can't wait. I can't wait to see your chandelier hanging either! Enjoy your day! I would love the green glasses too. Thanks for sharing your sister-in-law's lovely home photos. My first visit to your blog. Your sister in laws home is lovely and what a gorgeous table set for the party. What a magnificent score that vintage stove was, bravo! I quite like the green glasses too! There is nothing quite like blue hydrangeas! I "inherited" a pink and white one when we moved...must add whatever it is to turn them blue next year! Like you, I'm not really a "blue" person: but this must be the exception, right? This is my first visit to your beautiful blog, undoubtly not my last. What a lovely home your sister in law has, she was very gracious to open it up for all of us to have the tour you provided. A big Thank you to your sister in law. I'm sorry I didn't get my post up for this weeks party, but it will be ready to go for next week. lol... Looking forward to viewing more from your blog. The hydrangea's this year have been a rainbow of pink, lavender to beautiful blues. I love your sister-in-law's collection of blue and I think your next find for her are some cobalt blue glasses! Hope the chandie install is going well. My home is under renovation and you would be apalled at our living standards. Paper plates gasp!! Beautiful hydrangeas, and your sister created a gorgeous table. Maybe she'll let you borrow the green glasses! The planter on the patio is perfection! 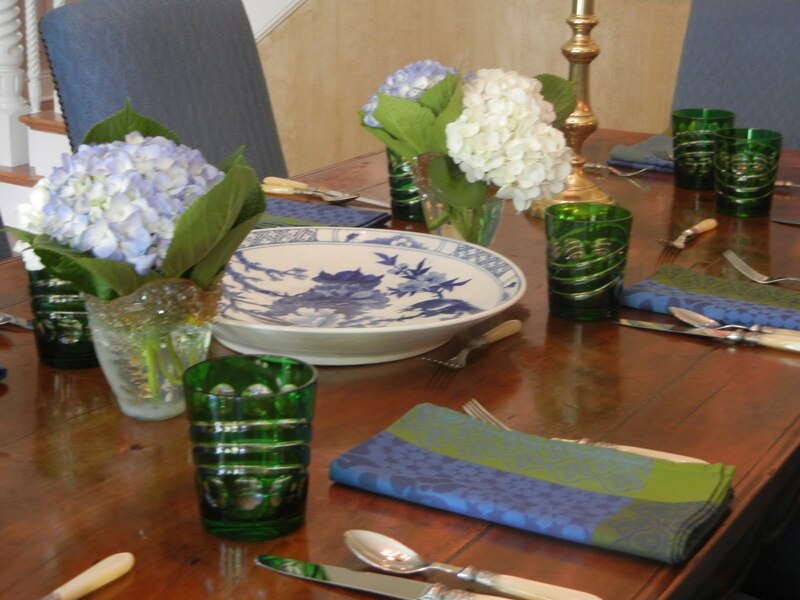 The table setting looks so lovely with the blue and green together. I also really really love Delfts blue porcelain and all of them in these images are so beautiful! When it comes to hydrangeas, I'll take them in any color! I love hydrangeas of all colors. The blue and green is lovely together,as are all of the blue and white pieces. I am delighted that I found your blog this afternoon, and I am a new follower.